i'm going to go ahead & apologize for the spectacularly horrible photos. i was preoccupied during the party.. & tonight i'm just too lazy to edit them..
and onto the most current birthday bomb. the dude turned 6 last year. when i show you all the details, your gonna wonder what the bomb is. the dude's sixth birthday was a 'rock & roll' birthday. it took a little convincing on my part, but he went for it. only took me 6 years to figure out i do cupcakes up good. cake in liner, icing on cake, slap a decoration on top. if you come to one of my birthday parties you will likely not see a cake again. like EVER. we melted some of those candy wafers & filled a star mold. it was an ordeal for the 30-something cupcakes we had..
but the dude had fun helping me. glasses ordered from oriental trading. ring pops & pop rocks from the dollar tree. rock star tattoos from oriental trading. a few of the kids wore their invites to the party..
i'll admit, it was fun to see them wearing them. ﻿that's the invite around her neck. a name badge holder.. or 'backstage pass' if you will. hand stamped & cut out name. star punched out of glitter paper. & guitars cut out of scrapbook paper. i had a couple of activities planned..
i gathered up a bunch of old colored halloween hair spray..
& when the kids showed up we let them pick how they wanted their hair done. once they got their makeovers..
& snapped a picture with my instax. i MEANT to take one with my regular camera as well for myself..
but i was busy.... & you'll see why..
he's got his picture inside his invite. what you can kinda see behind the pizza is a necklace. one of the other activities was making a necklace. i bought beads, necklaces & rockstar charms from oriental trading. put them all in a bowl & let the kids go to town making their own creation. 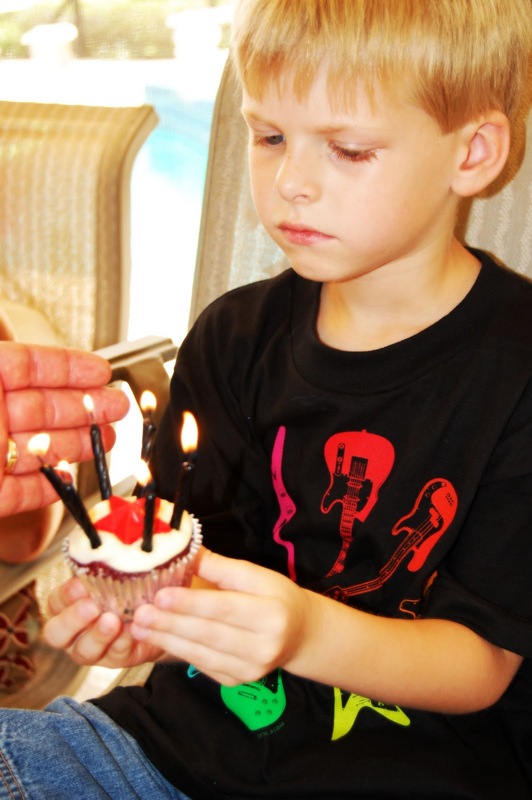 ﻿and here is the dude, blowing out his candles. this is one of only about 8 pictures of him that day. well, cause this birthday bomb comes in the form of non-participation. this kid slept through most of his party like he was a newborn. and when he was awake..
i couldn't drag him outside to have his hair sprayed. or even who was at his party for that matter. he had a MAJOR attitude as well. i was so irritated with him for being such a party pooper. and then the next morning when i took him to the doctor's because he'd been running a fever all night..
i felt like a total jerk for being upset with him. the poor kid had a double ear infection & strep throat. fyi. he's NEVER sick. like ever. so i figure after 6 years i finally have it figured out. don't make an ice cream cake for an outside may birthday.... you live in florida, remember. don't let your happiness revolve around people who don't care enough to follow through on showing up... the ones who do care will show. don't go overboard.... kids are happy with just each other & some room to play. don't spend so much money.... it doesn't always mean it will be more fun. don't try to make a cake (at all).... i am not a wilton employee (or martha stewart). don't forget why you are doing it... if he's enjoying himself.. forget about the rest. no one & no thing is perfect. i hope you've gotten some peace with your own birthday bombs these last few days. as mama's it's hard to take failure on some fronts. at least for me... but i'm learning. for a full list of birthday bombs & to read about why i'm talking about them click here. Aww..such a nice post! It must've been hard when you found out he wasnt well and we fuss over the times when our kid isnt behaving well or not listening whereas there is always a totally justified reason for it!